Even the event posters are archives. 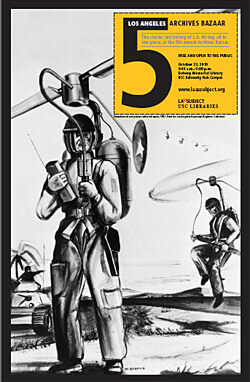 This one is based upon an illustration of a one-person rocket helicopter, 1951. From the Los Angeles Examiner Negative Collection. The Metro Library is among some 70 exhibitors on tap for the 5th Annual LA as Subject Archives Bazaar this Saturday at the Doheny Memorial Library on the USC campus in downtown Los Angeles. Never mind that it’s free and transit-accessible. Those of you with a compelling interest in all things transportation will be able to fill in the local backstory with virtual trips to the past, present and future of the greater Los Angeles region. Panel discussions cover blogging as history, newspapers as memories, and the legacy of Mexican mural artist David Alfaro Siqueiros. Los Angeles Times columnist and KPCC commentator Patt Morrison gives a journalist’s-eye-view of libraries and historical archives. All in one day? There’s also a range of documentary film screenings and educational sessions, including a how-to on getting started in research. Take the Silver Line to the Figueroa St. and Exposition Blvd. exit. To plan your trip and to check all other transit options, please consult Google Transit or the Metro Trip Planner. Footnote: Metro’s Digital Resources Librarian Kenn Bicknell chairs the web and technology committee of the L.A. As Subject project, a research alliance of more than 250 separate collections dedicated to preserving and improving access to the unique history and culture of Los Angeles.